It never fails. If I am with a group of friends and a meal is involved, we spend 15 minutes deciding where to eat. And if you’re on vacation with a group of friends, you can multiply that by a factor of at least 2. Now, if it were up to me, I would just hop in the car and pull over at the first restaurant that aroused my taste buds. But I am married, so that’s out the window. Single dudes, enjoy your aimlessness while you can. But here’s the deal, after five years of marriage, it pains me to say my wife’s approach is the best (single dudes, another realization: you are never right…even if you are). It’s better to know where you’re going before you leave the house. Knowing your destination means Google Maps can give you directions. And directions are huge. They give you peace of mind and save you precious time. And if we are real with ourselves, isn’t this all we want from life? Our final destination, and directions to get there. To put it another way, “Why am I here (purpose)? What am I supposed to do with my life (calling)?” These are the burning questions in everyone’s mind. Because we all know. It’s ridiculous to drive aimlessly until you find a restaurant that looks good. You need a destination. Your destination determines your path. The truth is every person has a calling and a purpose. We have a destination and a path. But, unfortunately, some of us will spend our lives wandering aimlessly with no direction. This can be avoided, however, if we just understand some truths about calling and purpose. So, let’s do it. Here are 6 truths about your calling. 1.) Your calling and your purpose are NOT the same. God’s purpose for your life is that you would mold your life around his image. PURPOSE – to mold your life around the image and glory of God and show that image and glory to the world. Huge point here. Don’t miss it. Your purpose informs your calling. If you want to use the road map illustration, your purpose would be the final destination. So, what is your purpose? Romans 8:28-29. This is why you and I are here. God created you in his image, and your purpose is to mold your life around his glory. This means you won’t find your purpose in what you DO and it is not a destination where you arrive. It is a journey. A journey to look, act, and think more like God. So, every time you proclaim truth. Every time you create from nothing. Every time you choose love, grace, and mercy over hate, bitterness, and resentment. Every time you reflect the nature of God in this world, you fulfill your purpose. Anything short of this is like traveling without a destination. 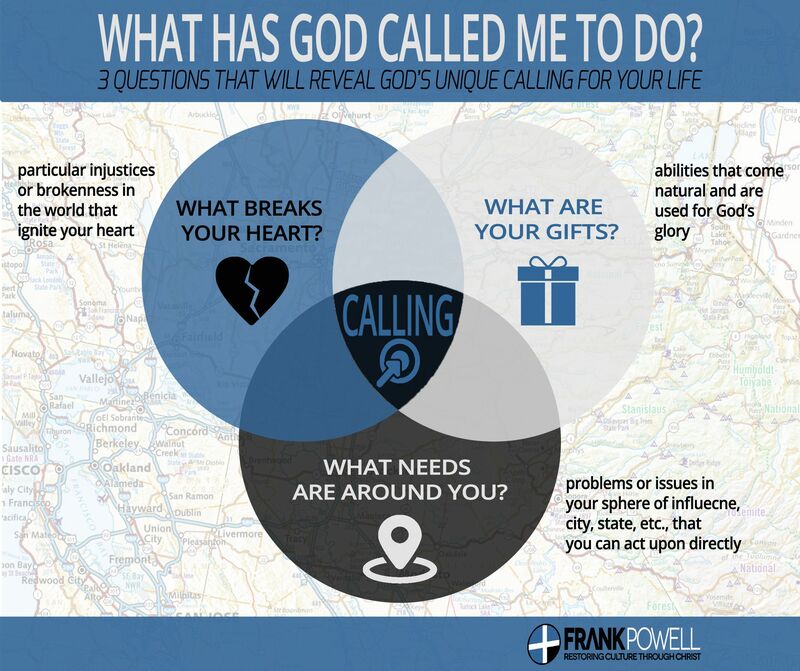 CALLING – the unique path God has for you that leads you towards the final destination (your purpose). Once you understand God’s purpose for your life, you can hash out your calling. But not until then. While the purpose God has for every person is the same, the calling is not. Every calling is unique. I can’t live out your calling. You can’t live out mine. Going back to the road map illustration, if your purpose is the final destination, your calling would be the unique path to the destination. God called you for a specific reason. You have a unique role to play as you live out your purpose. 2.) Your calling is NOT your career. This might be the biggest roadblock standing in the way of you and the calling God has for your life. Your calling is larger than your career. You are created for more than a title on a desk. At times your career might aid your calling. But this isn’t always true. Too many people in this world are chasing titles, statuses, and paychecks, not realizing these things can’t be caught. Your career is part of your calling, but it is not the totality of your calling. 3.) There is more than one way to live out your calling. What’s the shortest distance between two points? It’s not a trick question. The answer is a straight line. What’s the shortest distance between the present and your final destination (your purpose)? This is a trick question. The answer is whatever path God has carved out for you. Don’t be fooled by common logic. God isn’t confined to it. You shouldn’t be either. Too often we get worked up over a big life decision (change in job, marriage, etc.) because we have options and aren’t sure which option is correct. And logic tells us there is a right and wrong choice. Not so fast. I spent 7 years of my life studying and working as an engineer. I have spent the last 4 years in full-time ministry at a church. Common logic would tell me I wasted 7 years of my life in engineering. But Romans 8:28 is proof God slaps common logic in the mouth. You see, this verse gives me assurance that my 7 years in engineering weren’t a waste. In fact, this verse is proof God used those 7 years to prepare me for ministry at a church. This is how your calling works. There isn’t just one way to go. You might get to a fork in the road and realize God doesn’t care which direction you choose. Your calling might include a career change, a season in another country, or any host of other strange turns. But know this. God is working everything together for good. 4.) Your calling is not something you search for. It comes from within. Calling is painted as a holy easter egg hunt. The only difference is if you don’t find the golden egg in a typical easter egg hunt, you pout for a while and go about your business. If you don’t find the golden egg that is your calling, your entire life is ruined. Don’t believe the lie. Your calling is not something to be found. It comes from within. Your calling starts with the pursuit to find the unique talents and passions God has given you. And once you realize those talents and passions, using them as catalysts in every arena of your life. This explains why so many people feel empty and wander aimlessly through life. They try to find their calling by looking “out there” (the world) when true calling is found by looking “in here” (the heart). 5.) Your calling will never focus more on you than on God. What career are you pursuing and why? If you have a job, what drives you? How do you spend your time and why? How do you treat others? Take this to the bank. If you choose a career PRIMARILY for money or benefits, you are not living out God’s calling. If you spend most of your free time on you, you are not living out God’s calling. If you choose to retaliate and hate when you are mistreated, you are not living out God’s calling. How do I know? Purpose. God’s purpose is for you to reflect his glory. You can’t do that when you live for number one. The calling God has for you will never focus more on you than on God. It will not be about money, fame, or any other worldly virtue. Romans 12:1-2 is proof of this. God’s calling for your life will never focus more on you than on God. God’s purpose is about God. If you make your calling a selfish pursuit, you better pack a helmet. There will be some wrecks along the way. 6.) Your calling is more about daily obedience than a future position or realization. Be obedient today. What is God asking you to do right now? The hardest thing for many people to do is live in the moment. Yet this is the very thing God calls us to do. Regardless of the season of life, God wants you to be present and obedient to some things today. What are they? Daily obedience might mean you study hard for a test. It might mean are a stay at home mom and you love your kids well. It might mean you choose the right decision over the easy decision at work. Stepping into the calling God has for you means you learn to be obedient to the tasks in front of you today. You are here for a reason. God has a unique calling for your life. And this calling is wrapped in your purpose to reflect the image and glory of God. Be obedient every day. Live with passion. Pray for discernment. If you do this, your life will have meaning.